Wieden & Kennedy is a great Ad company that bought us the exceptionally cool “Old Spice Man campaign” in 2010 but its lastest “Chairs Are Like Facebook” Ad to celebrate it had reached its billion-user milestone has left this reporter and many people scratching our collective heads. To many people, Facebook is a Lovemark to them but this ad isn’t one fit for a Lovemark. For an ad that aspires to articulate “our values and who we are“, the least it should is to touch us emotionally, be meaningful, and may be have it stand the test of time. I’ve watched the Ad quite a few times now to make sure my comments express my feelings fairly. And I’ve also transcribed the words from the voiceover of “Chairs Are Like Facebook” so I can read it in full and you can see for yourself. “Chairs. Chairs are made so that people can sit down and take a break. Anyone can sit on a chair and if the chair is a large enough they can sit down together and tell jokes or make up stories or just listen. Chairs are for people and that’s why chairs are like Facebook. Doorbells. Airplanes. Bridges. These are things people used to get together. So they can open up and connect about ideas and music. Another things people share: Dance Floors. Basketball. A Great Nation. A Great Nation is something people build so they can have a place where they belong. in white appears on a black screen. Reading the about FaceBook Ad copy, it just seems, to me, totally disposable and ready to be thrown away next week/month and ready to be replaced by something flashy, different and new. In stark contrast, Apple’s timeless “Think Different” Ad campaign is so impressive a copy that I’ve personally heard it read out loud in wedding ceremony! Yes, people love it that much! As this reporter wrote in 2011 when the Steve Jobs biography was published, the voice (someone has to read the copy) of the voice over deserves tremendous attention! And I don’t know what happened in the Facebook voice over casting?! Anyway, here is what Steve Jobs went through in his struggle to decide whose voice to use. Have a listen and watch of the following two versions of “Here’s to the Crazy Ones” videos. 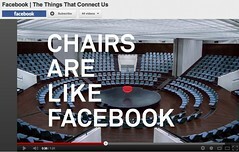 To this reporter, the normally cool Wieden & Kennedy has a big #fail in “Chairs Are Like Facebook” Ad. What do you think? This entry was posted on Thursday, October 4th, 2012 at 2:33 PM and is filed under advertising, Creative, Facebook, Lovemarks, social media, Video, World, YouTube. You can follow any responses to this entry through the RSS 2.0 feed. Both comments and pings are currently closed. It a boring ad. Failed.